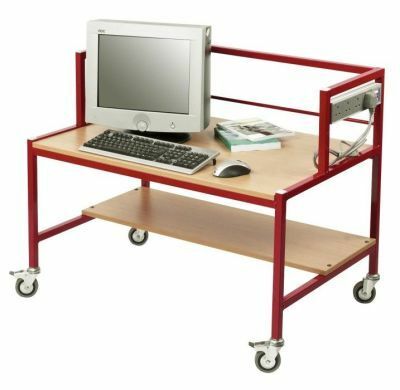 These education trolleys are perfect for classroom applications and are available for a free UK mainland delivery within 2 weeks from order. Available in a choice of 3 frame colours including Red, Blue or Grey and mounted on rubber wheels. Education trolleys that are designed to fit computers and for use in schools. The tops are finished in Beech and these are available in 3 different frame colours Red, Blue or Grey and these desks are made to order and are non-returnable. These have a 4-way power module fitted to the side of the unit and are available for delivery within 2 weeks from order. The desks are made to order and you will need to specify the height of the desk upon ordering. The heights vary between 500mm - 750mm and are separated into 50mm increments.